As stations go, Kensington Olympia has some strangely timetabled trains. Seven District line departures each weekday - five ridiculously early, plus two outliers mid-evening. An Overground service interlaced with hourly trains to Milton Keynes. But that's nothing compared to the unlikely service that pulls out once each weekday morning on the way to nowhere useful. The 10:02 to Wandsworth Road. The parliamentary train that Southern has to run, but they'd rather nobody caught. I caught it, braved the lies, and lived to tell the tale. Should you ever be standing on the southbound platform at Kensington Olympia just before ten o'clock in the morning, there are absolutely no clues whatsoever that a train is due. No 10:02 service is displayed on the departure board. 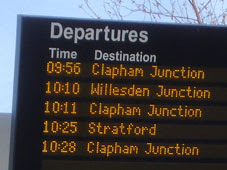 There's an 09:56 to Clapham Junction, and a 10:11 to Clapham Junction, but nothing's indicated inbetween. They don't want you to board this train, so they don't announce its arrival. At one minute past, as a four carriage green train appears in the distance, the display on the next train indicator changes. "Please stand clear. This train is not for public use" it reads. This is a lie. There's then an almost identical public announcement. "Please stand away from the train of platform 3. This train is not in use." This too is a lie, as it turns out. But they don't want you to board this train, so they pretend it isn't stopping. At two minutes past, the train arrives. Destination "Wandsworth Road", according to the scrolling display on the front, which baffles a few potential passengers because they don't know where Wandsworth Road is. A guard steps from the door in carriage number three and emerges onto the platform in town crier mode. He booms out a list of stations, slightly too fast, which confuses those on the platform still further. A group of lost-looking foreign tourists ask if the train is going to their chosen destination and receive a somewhat patronising "What did I say?" response. The guard doesn't want you to board this train, that's obvious, but he's not allowed to say so directly. As the guard steps back on board, a handful of optimistic souls follow him. Some are railway buffs and know exactly what they're doing. The 10:02 to Wandsworth Road, how uniquely exciting. Others drift on because they don't know any better, and it's a train, and it's bound to be going their way isn't it? Damn, thinks the guard, my ghost train has passengers. But not many. According to the scrolling display above the half-empty carriage, "The next station is Wandsworth Road". This too is a blatant lie, as we are about to discover. 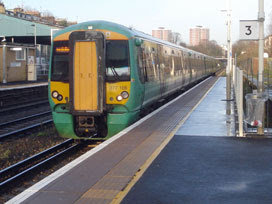 The train soon pulls into West Brompton station (where the next train indicator says "Passing service. Please stand back behind the yellow line") and stops. The doors open, and one passenger nips out to catch the District line train pulling in alongside. He clearly knew what he was doing. The guard acts swiftly to stop anybody else climbing aboard. "Ladies and gentlemen, please listen carefully. This train is for Imperial Wharf and Wandsworth Road only. If you haven't heard the destination you require, you're on the wrong train." Nobody moves. Three Japanese tourists with suitcases walk aboard, and we're off again. The train pauses again at Imperial Wharf, which is the second station the scrolling display hasn't suggested we'd stop at. The three Japanese tourists alight, which is fortunate for them because they'd not want to go where we're heading next. Our train is about to use not one but two curves of track that no other daily service touches, and all to keep those two curves of track officially open. Ssh, don't tell anybody. 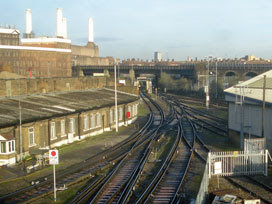 Once across the Thames we take the left fork, then another left fork, then right at Latchmere No 3 Junction, along the line that doesn't go to Clapham or Waterloo. Instead we dip beneath the mainline, negotiating our way through a maze of twisting tracks past a variety of warehouses and a wall of buddleia. This is no scenic rail tour, at least not yet, but the view out of the window is a rare sight. Beneath the line from Victoria, then beneath it again, this is one convoluted curve we're following. Past Nero Roasting, where your coffee comes from, past Video Europe and past Westminster Transfer. A series of carriages rumble past in the near distance, at all levels, on all sides. We pause on the viaduct for five minutes to let all the proper train services go by, affording a lengthy view of the adjacent factory roof. That's Battersea Power Station over there, and Queenstown Road bus garage down below, and Stewart's Lane train depot we've crossed... and I have this entire carriage all to myself. Come the end of this year there'll be proper trains on this particular bend, once the Overground overtakes the South London Line. They'll come this way to reach Clapham Junction, taking a subtly different route through this railway version of Spaghetti Junction. For now, however, there's just one forgotten train a day in each direction, and the driver's not rushing. At last the signal changes and the train moves forward onto the main track. A disembodied voice chimes "We are now approaching Wandsworth Road", which is the first scrap of truth we've heard out of her. Our terminating station is a short distance ahead, where this peculiar service terminates on the lonely southbound platform. It's not a lovely place to be abandoned, with the feel of a bypassed halt, and a set of dodgy steps down to the street. The guard pokes his head out to ensure that all his unwanted passengers have properly alighted, then the train swiftly departs, its legal duty complete. There is, so far as I can tell, no earthly reason why anyone would need to make this particular journey, especially when the single return trip isn't for another six hours. But for anyone who's interested, and can see through the train company's pantomime of lies, the ghost train to Wandsworth Road runs daily until December.